On Sunday, 10th August 1806, Patrick Bronte was ordained Deacon in Fulham Palace Chapel, and by October of the same year, he was established in his first curacy. He was ordained into the priesthood on Monday, 21st December 1807, in the Chapel Royal of the church of St. James, Westminster. 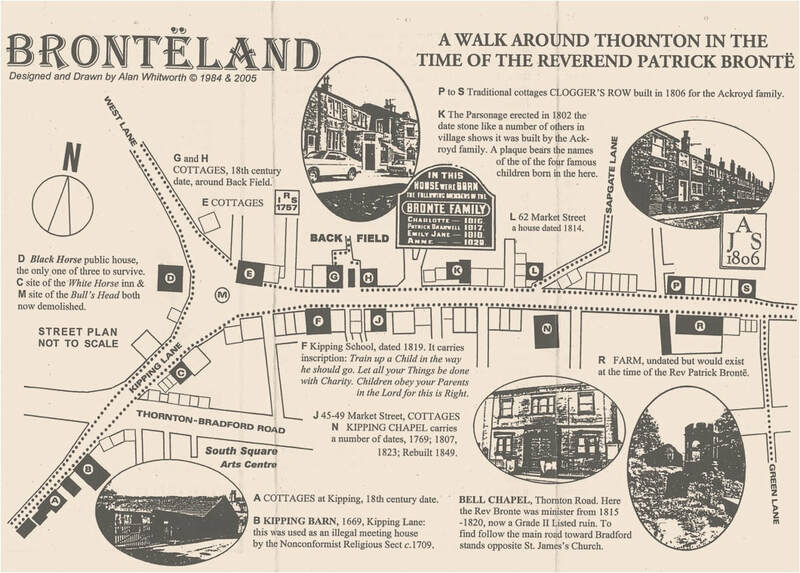 In June 1815, as the Duke of Wellington was defeating Napoleon at Waterloo and turning the war with France towards peace, the Reverend Patrick Bronte was taking up his clerical duties at Thornton with his wife and two children, residing at 72-74 Market Street - the old Parsonage. Today this house still stands, but surrounded on all sides, a contrast to the day when the Reverend Bronte moved in. At that period Thornton consisted of not more than two-dozen abodes, including three public houses; the entire village surrounded by bleak open prospects! Market Street at that time formed the main road to Bradford, the modern highway, a Turnpike Road, was not constructed until 1826. Only three lanes appear to have existed off Market Street, Sapgate Lane, Back Field and Green Land leading down the valley and across to Headley and Headley Hall. This put the Chapel, in which Patrick was to preach for his five year stay, well outside the village, to be reached by a footpath across the fields! But it was near to the lord of the manors residence, Thornton Hall. As for Thornton itself, the centre was formed around the junction of Kipping Lane, West Lane and Market Street, and the whole township comprised of little clusters of houses at Headley, reached via Green Lane, School Green at which stood Thornton Grammar School, Kipping, and Close Head and Leaventhorpe, where there stands another hall. Of the inns mentioned, only the Black Horse remains. The Bulls Head occupied a position in the middle of the triangle formed by the three lanes, and the present Post Office building stands on the site of another named the White Horse. Shop-keeping interests were represented by a general dealer whose stock it is said, 'might have been brought up with a fifty pence piece' and then there was t'owd butcher, who often was in trouble for selling suspect meat, or meat on Sundays, which was against the law in that period. Indeed, Thornton in the time of Reverend Patrick Bronte was a desolate place and there is no doubt the landscape lives on the descriptive passages in the novels of the Bronte children - Charlotte, Emily and Anne - who, along with Branwell, were all born in the small Parsonage House on Market Street at Thornton. The 'Bell Chapel' itself was rebuilt under the direction of the Reverend Bronte, and at the time it was finished in 1818, it was probably the third time the chapel had been altered. Certainly the date stone of 1612 mentions a rebuilding and it is though by many to be the dare of the first chapel, but it is known that the original chapel possibly dated back to the Middle Ages, being erected on the present site near to the residence of the lord of the manor at least by the 14th century. In 1820, the Bronte family moved to Patricks last appointment at Haworth. On Sunday, 7th June 1861, the Reverend Patrick Bronte, AB, died, bringing to a close a total of fifty-five years ministry with the established Church. From writings he left, it is known that Patrick found his years at Thornton some of the best in his long life that began on March 17th in the year 1777.